China has taken a very simple position with regard to both parties, which is that it wants to see oil production and export resumed by a fair agreement as soon as possible, and it has pressed both parties to negotiate seriously under the facilitation of the African Union. It has shown no interest in any other solution than utilizing the existing infrastructure, which was built by the Chinese for this purpose. So it has played a low-key but very consistent and firm role. I agree with de Waal. As I have noted before, China has engaged in an unprecedented "shuttle diplomacy" in Sudan. At the same time, Beijing's diplomatic dance at the United Nations has been fairly nuanced. After first resisting US-led efforts to pass a Security Council resolution with teeth (i.e. threats with sanctions) to stop the growing violence between the Sudan and South Sudan, Beijing joined the other SC members in a unanimous resolution threatening sanctions, at the request of the African Union. The contrast with Beijing's response to regional efforts by the Arab League regarding the Syria crisis is interesting (and would make a useful research paper). Comparing China's action in UN regarding Sudan / South Sudan and China's action in UN regarding Syria is like comparing oranges with apples. 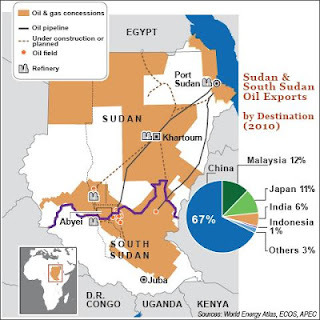 In the case of the conflict between Sudan and South Sudan, China's position is very clear - Both Sudan and South Sudan are desperate for cold hard cash and if they want China's money, they have to sell oil to China. And to achieve that, both Sudan and South Sudan have to find a way to come to peaceful terms. In other words, China gets Sudan and South Sudan to start talking peace by offering a carrot. On the other hand, on the Syrian issue, China is offering a stick, and no one can fault China for doing that. China (and Russia) was/were cheated by the West, regarding Libya. Both China and Russia were informed by the West that the UN resolution that they voted for was to persuade Colonel Gaddafi to take a more peaceful stance. Instead, after both China and Russia had voted for the resolution on the Security Council, the West used that resolution to overthrow Colonel Gaddafi's regime. I am sure you do understand that China is a country with a very long-history, and people with thousands of years of history have a long memory. China, and all red-blooded Chinese, will not forget the good deeds (along with the bad ones) that had been done to them by others. If you study Chinese history you would know that it's not unusual for Chinese repay their debts double or even triple the original amount. In terms of repaying the debt of a very bad deed, the Chinese has this to say "秋後算帳".